FAQs: Is a concrete sink waterproof? Will it crack or stain? 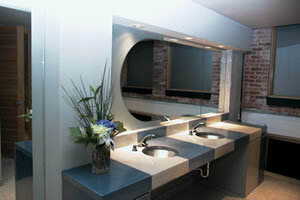 One of the benefits of choosing concrete for your sink is the range of colors available. Each concrete contractor offers his or her own unique standard and premium colors. And many will create custom colors to help you match or complement other materials. Samples will always be different because each contractor has their own secret recipe and different types and amounts of cement and aggregates. In fact, cement will vary in different parts of the country. There are different brands of pigments, stains, and aggregate colors, so concrete sinks will always be one-of-a-kind. The most popular method for coloring concrete sinks is integrally. Color pigments are added to the concrete mix before the sink is cast, creating consistent color throughout the entire piece. The hues available are nearly limitless, ranging from earth tones to more vibrant colors. Learn more about using integral colors to bring life to sinks: Paint-By-Number Concrete Color. 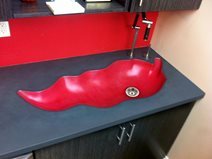 Concrete sinks can also be colored topically with stains. Stains produce a mottled look that many people like for its organic appeal. Typically available in earth tones, stains are great if you want a subdued sink. A little black pigment was added to this custom fossil-inspired sink to slightly darken the grey cement. This sink's countertop was colored in a custom gray made with integral iron oxide pigments. The red basin was also integrally colored. The concrete used to cast this double sink was integrally colored with a blend of walnut and red oxide pigments. To achieve a variegated look, the piece was intentionally cast with voids that were filled with a gray slurry mix. 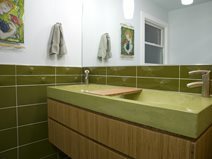 For this concrete vanity with integral sink custom liquid pigments in Key Lime were used to accentuate a tile mosaic.